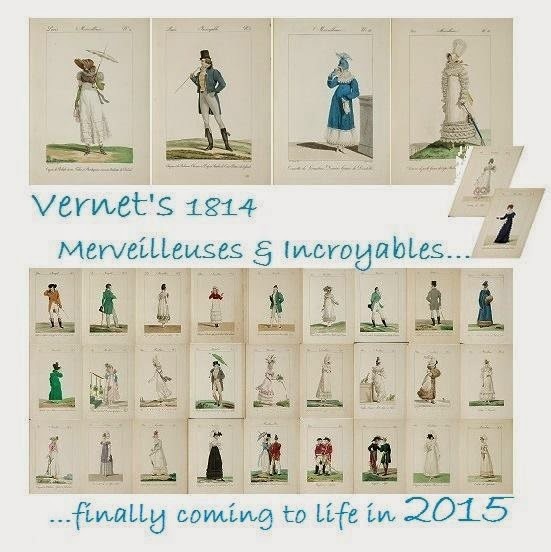 This year, I'm thrilled to be participating in a group project that will recreate the costumes illustrated in Vernet’s Merveilleuses and Incroyables from 1814. (for more info, check out the Facebook page) We are supposed to keep the dress that we are making a secret until the grand reveal in December, so I decided to focus my blog entries on undergarments and accessories for most of the year and save my dress for the very end. 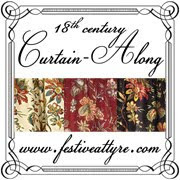 I’m really excited to have an excuse to make myself some new and improved Regency undies, and I am looking forward to hand-sewing everything from the skin out. I know, I know… that probably sounds like madness to many of you, but I’ve grown to love hand-sewing over the years, so it seems like a fun challenge to me. The first garment on my list was a new chemise. 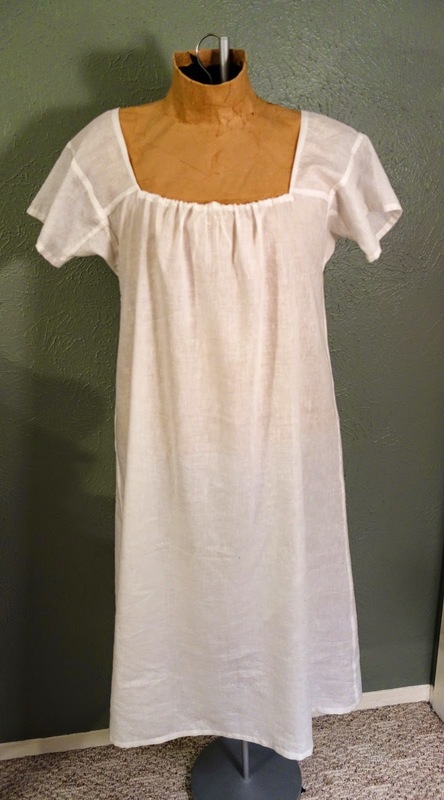 There isn’t much to blog about with a simple shift or chemise, but I’ll share my progress here anyway. 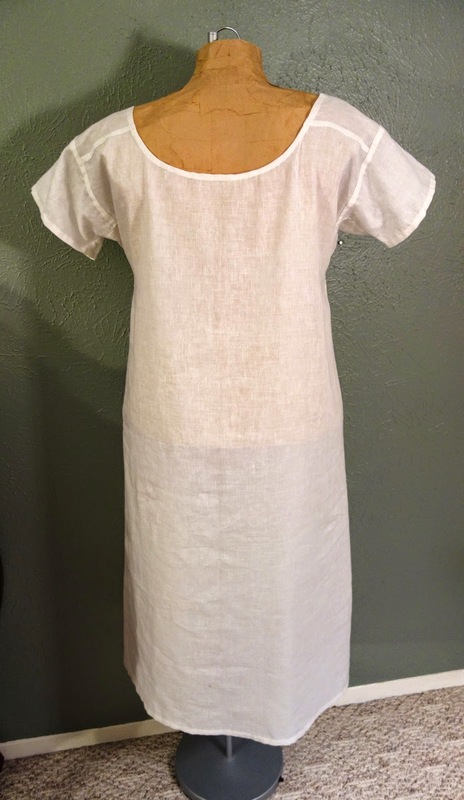 My chemise is made from a lightweight linen/cotton blend fabric, and it is stitched with linen thread. The seams are all sewn by hand with a small backstitch, then I flat felled the seams. I decided to use Laughing Moon #115 for this garment, and the pattern is based on a surviving chemise in the designer’s collection. The sizing worked well, and it saved me a good bit of time and effort vs. drafting my own pattern from scratch. 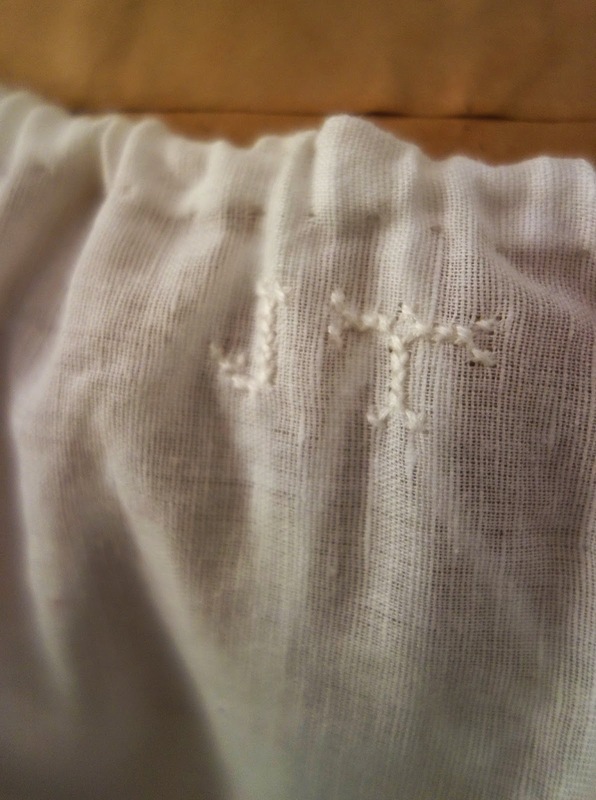 It would have been nice if the instructions had been more detailed about inserting the underarm gussets – those were tricky with the felled seams – but I worked it out eventually. I’m sure there are some wonderful tutorials online somewhere, but I was too lazy (or maybe too stubborn) to go searching for them. The only thing that I didn't like about this chemise pattern is that it has a very high neckline in back, so I cut it into a more rounded shape after it was assembled to lower the back edge. Both square and round necklines were common in Regency chemises, although I'm not sure if they were ever combined into one garment. I actually like the rounded back better than the square front, so I think if I made this pattern up again, I would choose the high neckline option for the front and then round off the shape of both the front and the back of the chemise. I also wish that I had cut the selvage down to something narrower than 5/8" before felling the seams. Period undergarments usually have tiny seams, and mine look pretty ham-fisted in comparison. But this was my first time to hand-sew a chemise, and I learned a lot from the process, so I'm still pretty happy with the end results. My biggest discovery was that chemises don't take nearly as long to sew by hand as I had feared. 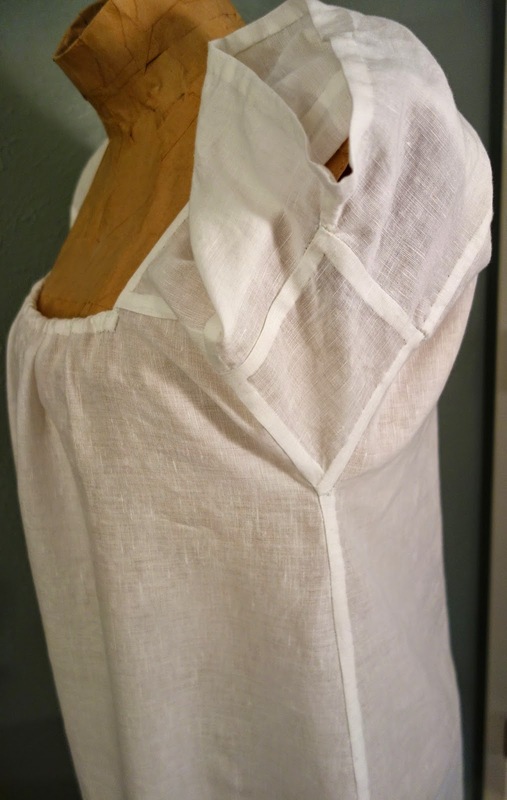 It always seemed like too much effort to hand-sew something that would rarely be seen by anybody other than myself, but this chemise made up so quickly that it was really no trouble at all. I only worked on it for a couple of hours over 3 evenings, and it was a soothing and mindless project while watching movies and TV.